NEW YORK—The way that Steven J. Rosen sees it, the Israeli-Palestinian peace process is being held back because of mathematics. "Multiplication of numbers does not lead to peace," said Rosen, an associate fellow at Middle East Forum and former AIPAC (American Israel Public Affairs Committee) executive, referring to Palestinian claims about their current number of qualified "refugees." Rosen joined Israeli Permanent Representative to the United Nations Ron Prosor and other experts last week at the Harvard Club of New York City for a conference to discuss the application and implications of the designation "refugee" as it applies to descendants of the roughly 700,000 Palestinians who left the nascent state of Israel in 1948. Prosor said the refugee issue is the "principal stumbling block" to a peace agreement. "No one will admit it, the real obstacle is the [demand for the] right of return for millions of Palestinian refugees," he said. 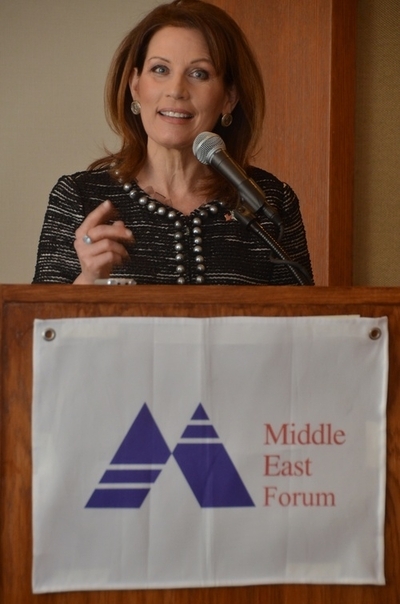 U.S. Rep. Michele Bachmann (R-MN) speaks at the recent "Changing U.S. Policy on UNRWA and the 'Palestine Refugees'" conference hosted by the Middle East Forum in New York City. Credit: Maxine Dovere. The Palestinians have long demanded that 5 million foreign Arabs who they claim are descendants of the 700,000 that fled in 1948 be allowed into all of Israel—not just Gaza and the West Bank—as part of the what they call their "right of return." Typically, the UN's policy is that only those who flee their countries themselves are considered "refugees," not their descendants. But the UN makes an exception for descendants of Arabs who fled Israel. In many cases, the countries where these descendants currently reside have refused to grant them citizenship. While bodies such as the European Union repeatedly condemn Israeli construction beyond the 1967 Green Line as an obstacle to peace, Prosor warned that in his mind, the largest obstacle is the Palestinian refugee population, which as currently defined by the Palestinians "would cause Israel's destruction." "It is essential to talk about the right numbers and the right image," Prosor said. He said the real number of refugees, those who fled themselves, is about 50,000. "Without a solution to this issue, there is no discussion of peace," Prosor reiterated. A major objective of the New York conference—titled "Changing U.S. Policy on UNRWA and the 'Palestine Refugees'" and hosted by the Middle East Forum—was to assure that the regulations of the UN Relief and Works Agency for Palestine Refugees in the Near East (the United Nations' aid agency for the Palestinians) fall in line with U.S. immigration policy. Discussions at the conference focused on redefining "refugee" as applied to a Palestinian population cohort that, under existing practice, retains that status generationally. Questions raised included the implications of citizenship granted to persons born in a country—a process that would remove millions of Palestinians from "refugee" status—and bringing the UNRWA designation into conformity with the U.S. Immigration and Naturalization definition of "refugee." The solution to the Palestinian refugee issue, said Rosen, "is not returning to Israel." "Addressing this problem does not harm peace… Negotiators will have to give the most intractable party enough room to make the deal happen," he said. After World War II some 100 million people around the world were categorized as "refugees." By 2013, only the Palestinians retained their refugee status, even with citizenship in another country. Rosen noted that several American presidents have urged that the Palestinians move away from the "right of return" demand. "The United States has never addressed UNRWAs pernicious practices," he said, noting that the State Department "has effectively endorsed UNRWA's operation." Rosen said the United States "remains a party to the UNRWA practice of listing Palestinians as refugees for generations." He cited several sections of U.S. immigration law that limit shared immigration status to a child under 18 who can accompany parents as refugees. UNRWA's listing practices violate U.S. immigrations laws that should be applied with consistency to bring those practices into compliance with U.S. standards, according to Rosen. "It is time to get the Congress to order the State Department to bring U.S. UNRWA policy in compliance with American law and the pursuit of peace," he said. According to the 1949 UNRWA definition, anyone who was a resident of the British mandate of Palestine between 1946 and 1948 and lost home or livelihood qualifies as a refugee. In 1965, UNRWA's definition was expanded to include descendants of those who fled, a standard that does not apply applied only to the roughly 850,000 Jewish refugees from Arab countries. Some of the reluctance to relinquish refugee status may stem from the Palestinians' belief that doing so will end their right to claim compensation for property they fled in 1948. But former Member of Knesset Einat Wilf told the New York conference that Palestinians do not need to have refugee status to be compensated in cases where they have clear titles to properties. Daniel Pipes, president of Middle East Forum, reminded the crowd that the number of Jews expelled from Arab countries is approximately equivalent to the original number of Palestinian refugees, and that the Jewish property left behind had substantially greater value. Fiorello Provera, vice chairman of the Foreign Policy Committee of the European Parliament, discussed the relationship between UNRWA and the EU. He noted that the EU provided over 1.7 billion euros to UNRWA between 2004 and 2007, costing every European citizen 342 euros. Funding for other refugees was limited to 13 euros per European during the same period. Provera also discussed the need to "shatter the opacity" of the UNRWA system and eliminate the use of Palestinian refugees as a political tool in the struggle against Israel. "Europe sees the Palestinians with guilt," he noted, describing the "refugees" as "hostages in the struggle of Palestine and Israel." Dr. Jonathan Schanzer of the Foundation for Defense of Democracies challenged UNRWA's claim that it is "pro-Palestinian." The agency, he said, had effectively created a "manufactured refugee crisis." Only Palestinians—and no other global population—can have citizenship in another national state and still maintain refugee status, he noted. "Palestinian nationals have been about the rejection [of Israel] rather than about creating something," Schanzer said. Schanzer noted that about 2 million of those the Palestinians claim to be refugees are citizens of Jordan and some 1 million lived in Syria. The Palestinian refugees, he said, have become "a living symbol, not a solution," and their "manufactured crisis" has become "an insurmountable task," he said. "If the numbers can be deflated, [a solution] is a doable task," Schanzer said. Concluding the program, U.S. Rep. Michele Bachmann (R-MN), the former presidential candidate, suggested that speaking about the Palestinian refugee issues "in terms of truth" would create "a counter narrative." She stressed that there is bipartisan interest in Congress in looking at the issues of Palestinian incitement and the issue of properly calculating refugees.